52 France, 3 printer?s proofs, all the same design, Société Générale du Credit Foncier, share certificates for 100 francs and 1,000 francs, both 1854, also Comptoir Central d?Escompte de Prets Hypothécaires, share certificate for 50 francs, 1850, ornate border incorporates allegorical figures, ships, factory and flowers, black, all VF. (3). 53 France, Charbonnages de Girardville Société Civile Catawissa Pennsylvania, part nominative d?interet, 1858, very decorative with many vignettes including, ships, forests, factories, allegorical females, black on grey, with full coupons, AEF. (1). 1113 France, Société Francaise de L?Hydrogene pour L?Aerostation & L?Industrie, part bénéficiaire, Saint-Cloud 1908, vignettes of dirigible and balloons, ornate border, black & red, with coupons, VF. (1). 1114 France, Société Nouvelle des Eaux Minérales Naturelles de Vichy, certificate No.4363 for one share, Paris 1900, very attractive design includes vignettes of spring, building and bottle, brown on salmon, with coupons, VF. (1). 1112 France, S.A. des Eaux Minérales Naturelles de Vichy-Cusett, share certificate, Paris 1910, very attractive Art Nouveau design with vignettes of females collecting spring water and panorama of the ?Source des Fees?, blue on pale green, with coupons, VF. (1). 1108 France, 7 bonds and certificates relating to hotels, Hotel Westminster, 1930, Hotel Baltimore, 2 types, both 1924, Claridges Hotel, bond, 1919, Royal Monceau Hotel Paris, 1924, Carlton-Hotel de Lyon, 1931, and Royal Hotel-Lyon, 1912, all with coupons, F-VF. (7). 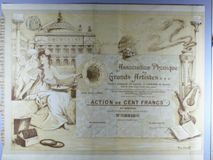 1109 France, B. Sirven S.A., unissued share certificate, Toulouse 1921, very large vignette of ?art nouveau? scene of woman and child admiring a painting, printed signature of the artist Luigi Loir, 1845-1916, brown on gold, VF. (1). 1110 France, Compagnie des Claridges Hotels, share certificate, Paris 1921, very attractive with large vignettes of ship and train, multicoloured, with coupons, VF. (1).